Crumble is a hot, fruit-based dessert. It is made by filling a dish with a couple of pounds of prepared fruit. A mix of flour, butter and soft brown sugar is rubbed together into fine crumbs that are scattered on top. The dish is then baked in the oven until the top is crisp and browned, and the fruit juices have bubbled up the sides and caramelised. It is a simple, rustic dessert that is usually made with autumn fruits and enjoyed as we Brits being to scent the beginnings of winter. Blackberry & Apple Crumble is the classic combination, although crumbles made with gooseberries, pears, plums or rhubarb are also popular. It is best enjoyed splodged any-old-how into a bowl, surrounded by a deep moat of custard. Some people claim to enjoy it with cold cream or ice cream (but they are just wrong). 02. How do I make a Gluten-free and Dairy-free version? It’s not possible to replicate the rich, buttery flavour of traditional crumble in a dairy-free version, but you can quite easily create a rich, nutty crumble that is equally complementary to autumn fruits. Coconut oil is used for richness and moisture, while ground nuts provide the structure and flavour. You can’t detect the flavour of coconut – particularly once you add a good pinch of ground ginger to the mix. Coconut palm sugar is used in place of brown sugar, as the two are interchangeable (except, unfortunately, in the matter of price!). Honey doesn’t have the same depth of flavour, and, more to the point, is too sticky and wet for use in a topping that needs fine, dry crumbs. However, honey is an excellent sweetener for fruit, so is used in the filling. 03. Do I need to precook the fruit? Firm fruits like apples and rhubarb need faily long cooking to soften and release their juices. If cooked from scratch with the crumble topping, then the topping will be overcooked and burnt by the time the fruit is cooked. For this reason, firm fruits are usually precooked in a saucepan for a few minutes before the crumle is assembled. Small, tender fruits like gooseberries do not need to be precooked, and will collapse into a textureless mush if they are overcooked. To a large degree, this is a matter of preference. I like the apples and blackberries to mingle, and so I precook both together. If you prefer a chunkier texture then you could chop firmer fruit into larger pieces, or skip the precooking stage altogether. However, less juice will be released while the crumble cooks in the oven, and less sweetness will develop as the fruit breaks down. 04. Do I need to add a thickening agent? 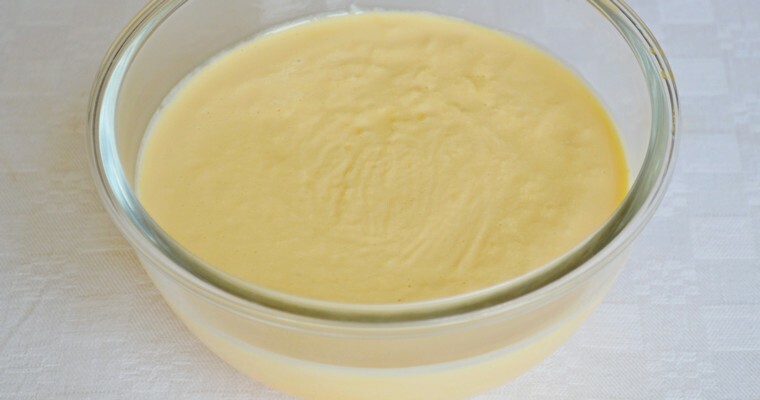 Some recipes call for a tablespoon of cornflour to be mixed in with the fruit, to thicken the sauce. This is not always necessary, as most fruit fillings are gelatinous enough to prevent the topping from sinking down. The key is not to add too much liquid – either in the form of water during the precooking stage, or excess sugar during the sweetening stage (sugar basically acts like a liquid in bakes). However, it also depends on the type of fruit used. You do not usually need to add a thickener if you are using fruits that are high in pectin, such as apples, damsons, gooseberries and plums. Pectin is a natural gelling agent that helps set jams. Softer fruits like apricots, peaches, pears and berries contain lower levels of pectin. The level of pectin is also affected by the age of the fruit, as levels decrease as fruit matures and ripens. Acid helps to draw out pectin during cooking, which is why crumble recipes often include a tablespoon or so of lemon juice. So there is no hard and fast rule about whether or not a thickening agent is needed, as it depends on the type and age of the fruit you use. Just keep an open mind and assess whether you need to add one after you have precooked the fruit, and can see whether the texture is thin and runny or thick and gelatinous. 05. How much sweetener should I add to the fruit? The amount of honey needed will vary according to the natural sugar levels of the fuit that you use. These vary according to the type of fruit, but also according to the age of the fruit (during ripening, the sugar content of fruit increases as starch is converted into sugar). Rhubarb can be bitter if not enough sweetener is added, which is why it is often partnered with sweeter fruits like Rhubard & Strawberry Crumble. Your best guide is to taste the fruit filling and add more honey as necessary. Wait for it to cool, as it is difficult to taste sweetness in very hot food. And few things are hotter and more threatening to the skin on the roof of the mouth than boiling fruit sauce. Brown the topping. Preheat the oven to 180°C/355°F. Place the hazelnuts in the small bowl of a food processor, and pulse until coarsely ground. Do not over process into a powder, and do not worry about achieving a uniform grind – the odd chunk here and there all adds to the texture. If you do not have a food processor, then seal in a bag and bash thoroughly with a rolling pin. Mix together the hazelnuts, almond flour, coconut sugar, salt and ground ginger in a mixing bowl. Add the melted coconut oil and mix until evenly coated. Thinly spread over a large metal roasting tray. Transfer to the preheated oven and roast for 8-10 minutes, until just starting to colour (it will go back in the oven for 20 minutes later on). Stir halfway through, and turn the tray for even colouring. Scrape the topping mixture back into the mixing bowl. Add half of the egg, and stir until blended. The granules should look moistened, but separate and distinct – not so wet that they clump together into a dough. If the mixture is too dry and powdery, add more of the egg, a little at a time, until you achieve the right consistency (you will probably not need the whole egg). Lightly rub between your fingertips to break up any clumps and create fine crumbs. Set aside. Precook the fruit. Meanwhile, combine the apples, blackberries, star anise, cinnamon stick and cloves in a large saucepan. Add the merest splash of cold water to stop the fruit from sticking to the pan at first. Heat over a medium heat until the fruit juices are released from the berries and the apples have softened but still retain some shape – about 10 minutes. Stir in the honey. Assess whether a thickening agent needs to be added. If the fruit pieces are sitting in lots of liquid, measure out the arrowroot powder and cold water into a mug and stir to form a smooth paste. Turn the heat up to high, and pour the paste into the pan. Stir constantly until the sauce suddenly thickens – about 1 minute. Turn off the heat immediately. Wait for it to cool a bit, then taste and add more honey if you think it needs sweetening. Assemble the crumble. Spoon the fruit filling into a 23cm/9″ pie dish, or an ovenproof dish with 1 litre/1 3/4 pints capacity. 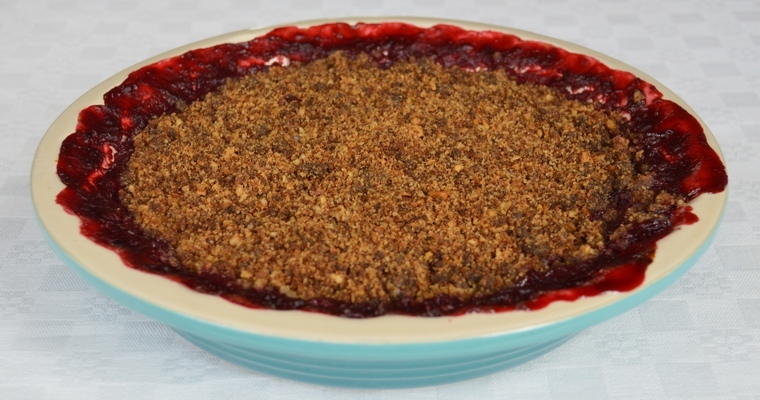 Lightly scatter over the crumble topping until the fruit is evenly covered. Do not press down and compact the topping. Transfer to the oven and cook for 20-25 minutes, or until the top is golden brown and the fruit juices bubble up the sides. Remove from the oven and leave to stand for at least 10 minutes. Serve immediately or eat cold, with lashings of custard.